According to Microsoft, the remote user can use a specially created a web-site to compromise a vulnerable system. The vulnerability is caused due to a memory corruption error when handling certain objects. Exploitation of the vulnerability allows an attacker to gain the same rights as the device user. If the victim is logged on with administrative privileges, an attacker who successfully exploited this vulnerability has complete control of the affected device. A hacker could install programs, delete data and add new accounts. Microsoft strongly recommends that you install the update that fixes a critical vulnerability. [CVE-2015-2502] The vulnerability allows a remote user to compromise a vulnerable system. The vulnerability is caused due to a memory corruption error when handling certain objects. This can be exploited compromise a vulnerable system via a specially crafted web-site. NOTE: The vulnerability is actively exploited at the moment. What does that mean? Latest version of what? From what manufacturer? Microsoft? Asus? 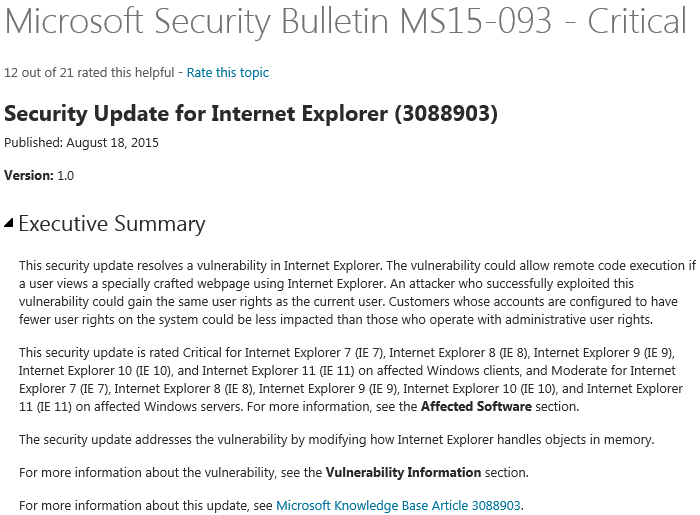 MS15-093: Security update for Internet Explorer. This security update resolves a vulnerability in Internet Explorer that could allow remote code execution if a user views a specially crafted webpage by using Internet Explorer. According to a report from IT security firm Symantec the patched flaw was being used in attacks targeting visitors to the website of the Evangelical Lutheran Church of Hong Kong. Thank you for the post about the vulnerability in Internet Explorer, you helped me a lot.